Close liaison with contractor and consultant meant potential for problems over design were avoided. The presence of an experienced Gantrail Supervisor on site ensured a timely completion of the installation was achieved. The establishment of a positive working relationship with our customer and the consultant provided for a successful project. Aqaba is strategically important to Jordan as it is the country’s only seaport. The container port needed to be expanded to cope with a significant growth in traffic. The overall plan was to extend the berth to increase the number of vessels able to be docked at a time. It was also decided to introduce large cranes that will be able to load and unload larger vessels. As the new cranes were significantly heavier than the existing cranes it would be necessary to install a larger crane rail on the existing quay. There was also the challenge of accommodating a wider span on the new cranes so a new beam was to be installed by MAG Engineering. This beam will support a new crane rail, landside of the existing rails to allow for the wider span of the new crane. 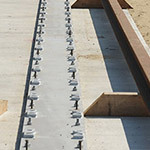 MAG Engineering placed a subcontract with Gantrail for the supply of the rails and fixings system for this new rail which included 396 metres of A120 together with Gantrail 9220/20 Rail Clips, 396 metres of Gantrail MKVII Pad, all supporting soleplates bolt pockets, anchor bolts, grout and welding materials etc. Also included in the order was provision for Supervision by experienced Gantrail Site personnel. One of the main aims was to minimise disruption of the operations of this important port. To achieve this the civil work was carried out in stages along the quay. 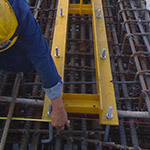 Later the Crane Rail was installed in one continuous phase. The timescale for this project was quite tight. Gantrail worked with MAG Engineering and the Consultants Cullen Grummit and Roe to complete the design phase and afterwards worked with both parties during the civil works to give advice where needed, attending meetings on site. It was necessary to keep to schedules as the arrival of the crane was already planned. 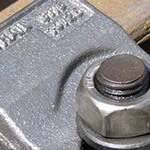 Installation of the rails was carried out by MAG Engineering under the supervision of Gantrail who also completed the welding of the rail joints through their own qualified welders using the Aluminothermic Welding Method. 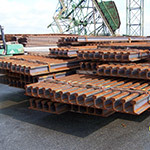 Gantrail supplied all the materials for the welding including the equipment. As mentioned above, the need to complete this work without disrupting the operations of the port was paramount. 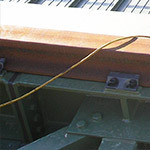 At one stage serious consideration was given to working in sections but, whilst this was beneficial during the civil work phase, it was agreed that completing the installation of the rail in one continuous phase would be far more efficient. Bringing together a team of very experienced personnel made this possible and all the work was completed on time. Extending a quay and installing a new crane requires a major investment by the Port Authority. 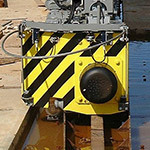 The Crane Rail System, whilst in value when measured against the overall cost, may seem a very small part, is critical to the whole operation. 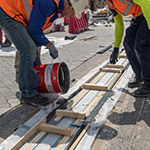 Employing the services of a specialist company such as Gantrail ensures a smooth transition and can greatly reduce the time on site to complete the installation thus saving a considerable amount of money.